My daughter loves jewelry. She's at the age now that she has her own "style" and is able to help create her own jewelry. It has been so fun for the both of us, and definitely a lifesaver for me to be able to let her have something to create on her own while I'm laid up with a broken leg and not really able to help much. 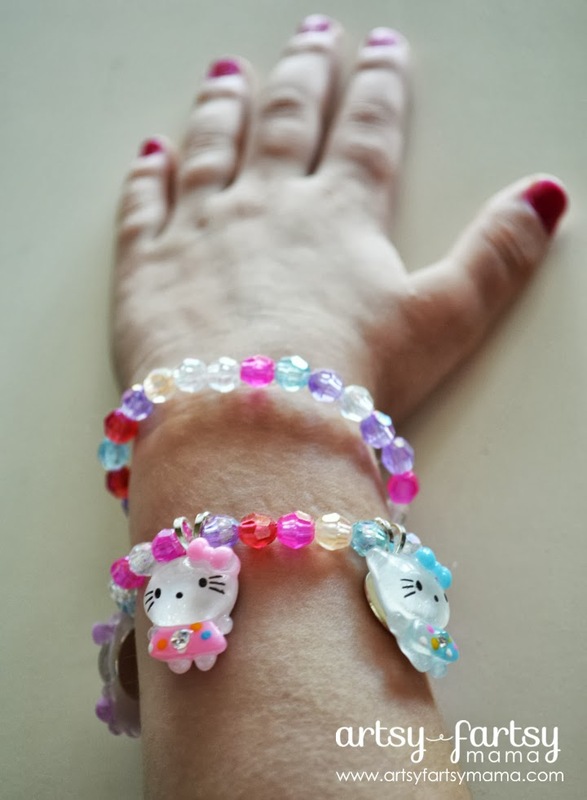 This bracelet coordinates with the Hello Kitty Bubblegum Necklace, but we used faceted beads from CraftProjectIdeas.com instead of the larger bubblegum beads. *Please supervise younger children. These beads are small and you don't want anyone choking on them! Measure your (or your daughter's) wrist, then add 2-3 inches. Cut that amount of Stretch Magic cord and pre-stretch it. This will make it fit better when you are finished with the bracelet(s). 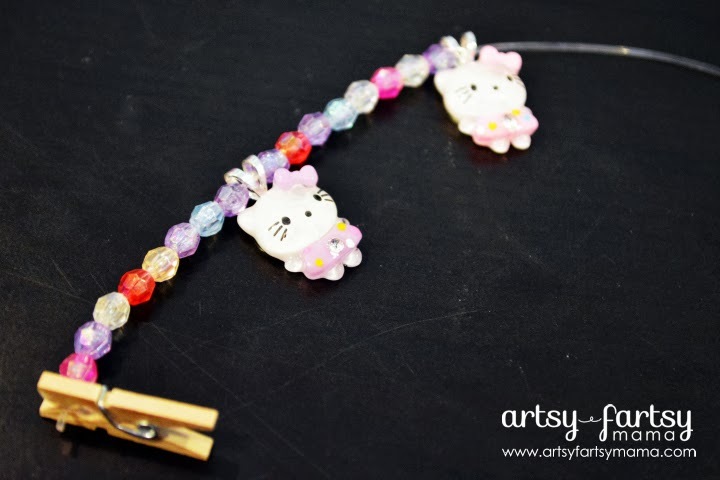 Clip the clothespin to the end of the cord and start stringing the beads. 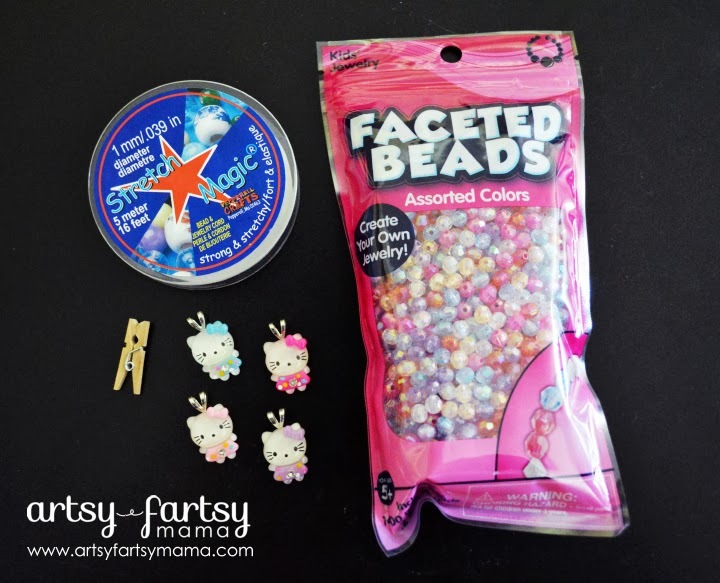 Depending on the wrist size and the amount of charms you're using, you'll need to play with how many beads to use. 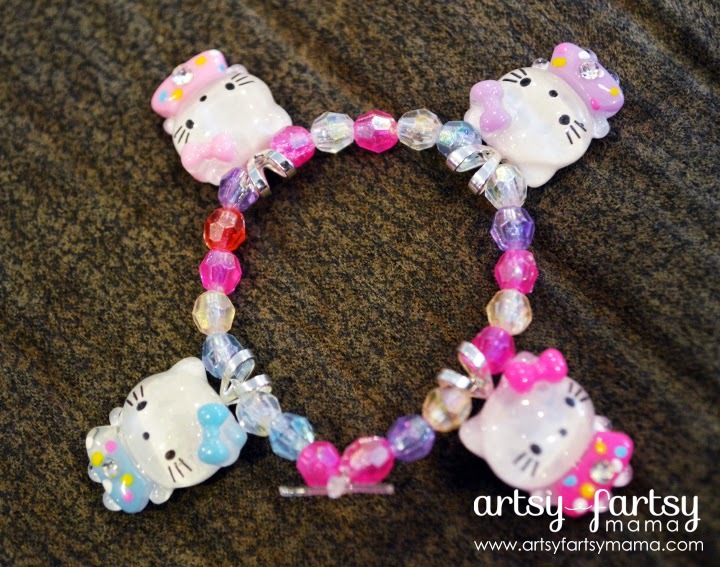 We ended up only using 5 beads in between each Hello Kitty charm since this bracelet was so small. We also made another bracelet that was full of faceted beads to go with it. I poured all the beads into a cup and let her add all the beads to the cord. She loved being able to do it all on her own. 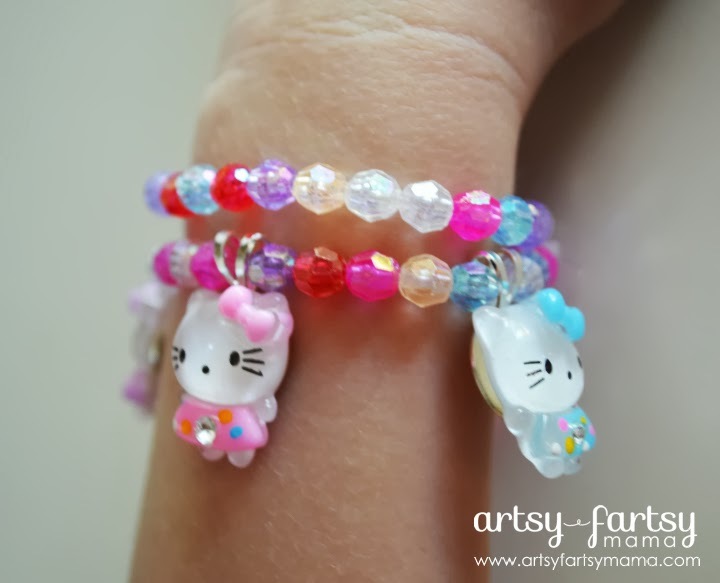 Since my daughter's wrist is so tiny, we ended up only using 5 beads in between each Hello Kitty charm. We also made another bracelet that was full of faceted beads to go with it. Once you've strung all the beads on, tightly tie the cord in a double knot. It will slip, so pull as tight as you can, and tie a few more knots, pulling tight. Find someone to help you hold the cord, pulling the knot tightly together. Add a drop of super glue on the knot and let dry. Trim the cord about 1/4" away from the knot and it should hold. Put your bracelets on and show off your new "stylish" arm candy!